In another sign the Bay Area real estate market has hit another WTH moment, a Mountain View home went up for sale for $1.6M, with a big catch: the seller wants to be able to live there for the next seven years, for free. 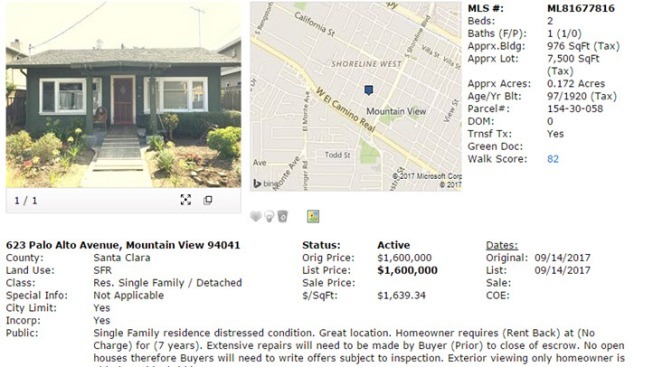 Screen grab of MLS listing shows a Mountain View home for sale for $1.6 million. The catch? Seller wants to live there seven years for free. They say location is everything in real estate and Mountain View’s 94041 zip code is among the most desirable in the Bay Area with excellent schools and short commutes to Google, LinkedIn and other high-tech hubs. But a new home on the market may take the cake when it comes to the phrase “it’s a seller’s market.” The 976 square-foot home on a 7,500 square-foot lot is listed for $1.6 million. Sounds like a relative bargain at first, but a closer look at the seller’s requirements reveals the true cost of ownership. That’s real estate talk meaning the seller wants to continue living in the home for seven years, after it’s sold, for free. NBC Bay Area reached out to the listing agent who explained it’s a sad situation, as the homeowner is elderly and would like to remain in the home. However, Brown said he didn’t think it was an unusual asking price for the area. "In almost 40 years as a realtor, I have never seen terms of sale that included seven years free rent back, not even seven months free rent back," realtor Erika Enos said. She warns buyers to be careful about fixing up or repairing any home before closing escrow. "What if the property does not close or the seller is unhappy with the results or work men don't get paid and put a lien the property?" Enos said, "The asking price reflects market value, which is essentially lot value, for this area. I empathize with the seller but the terms and conditions for this sale I feel are unrealistic and may have negative legal ramifications." Real estate site Zillow estimates the property is worth $1.73 million. 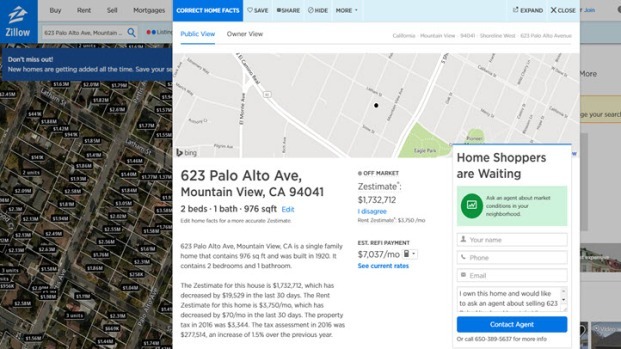 A screen grab from Zillow.com shows a home in Mountain View for sale. This follows the recent sale of a home in Palo Alto at 2101 Princeton Street that sold last month for $2.9 million, a whopping $1 million over the original asking price of $1,995,000. A Sunnyvale home near the new Apple spaceship campus, also made headlines when it sold for $800,000 over the asking price. It might make the $1.6 million Mountain View look like a steal. As long as you don’t need to move in until 2024.